Oct. 24, 2017 7:50 a.m. When a massive ice breaker arrives in Victoria’s harbour this week, it will mark the end of a 150-day-long journey exploring Canada’s coastline, communities and future. The trip from Toronto to Victoria via the Northwest Passage coincides with Canada’s 150th birthday celebrations, but celebrations are just the beginning, said Geoff Green, expedition leader for Canada C3. By the end of the journey, the ice breaker — called the Polar Prince — will have travelled 23,000 kilometres and visited 75 different communities. More than 400 people have climbed aboard the ship over the course of Canada C3 — or Coast to Coast to Coast — including community leaders, musicians, chefs, scientists and other curious Canadians. “It’s been a journey to help us look at our past, present and future, learn a lot about this country, it’s successes and it’s flaws and to look ahead to how we can be better,” said Green, founder of the Students on Ice Foundation, which leads educational trips to the Arctic and Antarctic. The experienced adventurer said C3 has led him to meet incredible people and visit amazing places over the past five months and his biggest takeaway is hope for the future. “I leave this 150-day journey with a great sense of great optimism, hope and potential for Canada in the next 150 years,” Green said. Racelle Kooy of the St’at’imc and Secwepemc First Nations in British Columbia’s Interior said she was originally hesitant to take part in a project celebrating Canada’s 150th anniversary because of the country’s troubled history with Indigenous Peoples. After speaking to other Indigenous participants, she decided to join and Kooy said she has been able to sincerely engage with everyone on board. “We’re a group of people from a variety of backgrounds, there’s so much to learn from each other,” she said. For her, the trip has been about breaking down existing myths and building connections between communities. “I think that’s very powerful,” Kooy said. For other participants, the epic voyage has been an opportunity to do unique research. 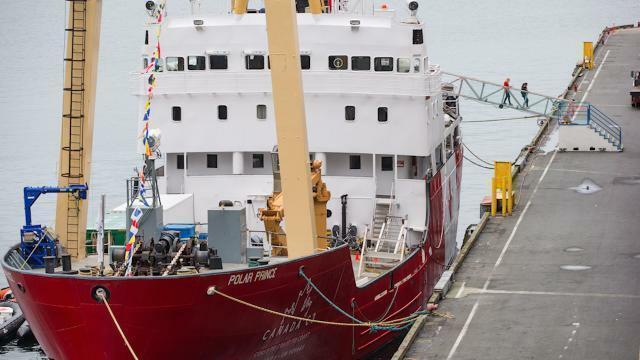 The ice breaker, originally built for the Canadian Coast Guard in 1958, is outfitted with a science lab where 23 projects have taken place since June 1. Kristi Miller is a scientist with the Department of Fisheries and Oceans who joined C3 to map organisms in different bodies of water by looking at cells left behind by everything from bacteria to marine mammals. The data has surprising findings. Miller said she never would have expected to see evidence of predators that rely on aquatic ecosystems for food so far out in an ocean-adjacent inlet, but samples taken off the coast of B.C. show both predator and prey. Results from the study could help determine the health of various ecosystems, said Miller, who is based in Nanaimo, B.C. “Having some kind of indication of ecosystem health in the ocean is paramount and this technology is fast, cheap, easy to do, and doesn’t require any destructive sampling or big ships,” she said. While many of the C3 participants have come and gone over the course of 150 days, Captain Stephan Guy has been at the helm of the Polar Prince throughout the voyage. The project has allowed Guy, who is based in Lac Beauport, Que., an opportunity to join an elite group of seamen who have traversed the Northwest Passage. He said the journey has reminded him of his “colleagues” who attempted the same voyage 200 or 300 years ago with varying degrees of success. The highlight of the trip has been watching people come together and share, Guy added.